You might not know him, but he probably knows your coffee order. Richard Perce truly exudes what it means to be a Lobo. After earning his bachelor’s in fine arts from The University of New Mexico in 2003, he ventured off into the landscaping industry with no intention of coming back to campus. 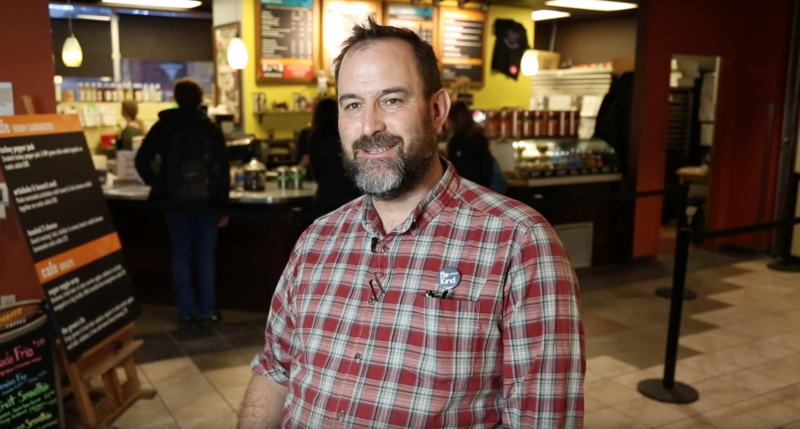 After joining the Flying Star/Satellite Coffee family, he was selected to come back and manage their location on main campus. His journey is not like most, but we’d like to think his presence here on campus isn’t just coincidence but our community’s destiny. When you stop by Satellite, you are almost always greeted with a smile and a welcoming presence that’s only heightened by the sweet and bitter smells behind the counter. This environment can only be sustained by someone who truly is passionate for the product their selling, the people they’re hiring and the customers they are serving, and Richard is arguably one of the most passionate Lobos you’ll ever meet. Richard’s passion of people can be found in more ways than one. Whether it’s from the music that’s being played throughout his store to the action figures placed all around the back counter, Richard wants to make sure that every customer that chooses to stop by knows that Satellite welcomes them with open arms. His impact on UNM’s community spans far and away from just providing it with caffeine and delicious treats. Richard will always be the first to help any person, department or office with whatever they need with the hope that they go on and do good things for their community. “He’s been a real active force in promoting different student and faculty organization on campus,” said Elizabeth Hutchison, Professor of History. One thing that separates Richard and his store from others is that his counter houses information on various resource centers and events so every person that comes through his line has the opportunity to learn something new that day. Richard’s impact on the UNM community will have a lasting impact for years and years to come. Whether he’s making your drink or asking about your vacation, his excitement and love for UNM will always be associated for as long Satellite is a part of our campus.